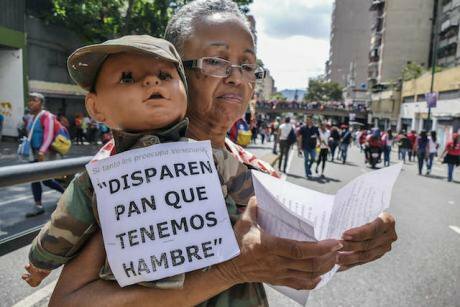 woman seen holding a doll and placard saying "Shoot bread, we're hungry" in Miranda, Caracas' city centre on January 10, 2019, the day Nicolás Maduro started his second term as president. Image: Roman Camacho/Zuma Press/PA Images. All rights reserved. Venezuela enters 2019 amid profound political turmoil, enormous uncertainty and risks that its crisis could turn into a dangerous military confrontation. A collapsed economy, hyperinflation and the government’s intransigence and repression have already led more than three million Venezuelans to leave the country, creating one of the region’s gravest migration crises in recent history. On 10 January, President Nicolás Maduro began his second six-year term of office, even as many Latin American and Western governments, as well as the EU, refused to recognise the 2018 presidential election as democratic. Then, on 23 January, as mass protests once again rocked the country, opposition politician and chairman of the National Assembly Juan Guaidó, supported by much of the Venezuelan opposition, announced he was assuming an interim presidency. The U.S. and many Latin American governments – though not the EU – immediately recognised Guaidó as Venezuela’s legitimate leader. Guaidó’s and his backers’ move represents a considerable gamble; its success hinges on whether it can provoke splits in the Venezuelan military and win support within the security forces. Thus far, it has not done so; indeed, Venezuela’s top brass declared its loyalty to Maduro. The opposition appears to have no backup plan and now faces a serious threat of violent reprisals by the government. Maduro announced that he was breaking diplomatic relations with the U.S. and would expel its diplomats; the U.S. thus far has refused to withdraw them. A serious crackdown by security forces on the opposition and any threats to U.S. officials could dramatically raise prospects of a potentially highly dangerous foreign military intervention. Meanwhile, Russia, China, Turkey and others have reiterated their support for Maduro. - Increase aid to alleviate the humanitarian emergency both inside Venezuela and among refugees. Having won a deeply flawed election last year, President Maduro assumed his second term as president showing little sign of being able to resolve Venezuela’s major economic, humanitarian and political crises. Last year’s vote saw the authorities bar some of the most popular opposition candidates, while experienced national election observer bodies reported blatant coercion and vote-buying, widespread use of state resources in Maduro’s favour and his campaign’s dominance of state-run and most independent media. Since then, Maduro had been pursuing potential dialogue with the opposition through his main negotiator, Information Minister Jorge Rodríguez, who continued to maintain sporadic contact with some opposition leaders. Rodríguez, say opposition sources, had offered fresh general elections in exchange for the opposition agreeing to back some (ostensibly minor, but unspecified) changes to the Constitution. This would in theory have allowed the National Constituent Assembly – a body installed in 2017 supposedly in order to reform the constitution but that is stacked with Maduro loyalists and in effect dilutes the power of the National Assembly – to be wound up. The National Assembly, which remains the only Venezuelan institution with undisputed democratic legitimacy, derived from the last free national election in 2015, would – again, in theory – then retake the legislative reins. Soy Venezuela leaders [...] for months had been pushing for a parallel government, and even foreign military intervention, to topple Maduro. However, the government had apparently ruled out reforming the electoral authority, which is currently heavily pro-government, and did not contemplate an early presidential election, except potentially after three years under the constitution’s recall referendum provisions. In 2016 it used its control of the Supreme Court and the electoral authority to block a recall referendum, and would have been in a position to repeat this tactic in 2022. Moreover, government negotiators (and Rodríguez in particular) have a history of reneging on commitments made during talks and of using “dialogue” to divide and demoralise the opposition. As a result, only substantive, unilateral confidence-building measures, such as moving to restore the powers of parliament or releasing all political prisoners, would be likely to bring the opposition back to the table. If Maduro’s stranglehold over state and judicial powers remained the most important obstacle to meaningful talks, the opposition faced its own divisions and weaknesses. Hardliners, who broke away from the main opposition coalition in September 2017 to form the Soy Venezuela group, rejected talks with the government or participation in elections, arguing Maduro must first be ousted. Soy Venezuela leaders, many of whom are based outside the country, for months had been pushing for a parallel government, and even foreign military intervention, to topple Maduro. Their calls for an alternative government had been supported by Organization of American States (OAS) Secretary General Luis Almagro and a handful of very vocal commentators on social media. Moderates and radicals aligned behind the declaration of Guaidó as president [of Venezuela]. Under new parliamentary leadership, opposition leaders in the country were attempting to regroup, strengthen their position with the electorate and fracture the ruling coalition by stressing the contested status of Maduro’s presidency and offering amnesty to those willing to abandon him. Over recent weeks, their reinvigorated campaign mobilised large crowds at opposition rallies across the country, and sparked dozens of small-scale protests in formerly loyal chavista neighbourhoods in downtown Caracas, where residents voiced their anger at sky-rocketing prices and deteriorating living conditions. Several dozen National Guard troops in Caracas seized a barracks after stealing some weapons, but were arrested soon after. Buoyed by these displays of public despair and shows of support for the new opposition strategy, moderates and radicals aligned behind the declaration of Guaidó as president. However, if this move fails to provoke splits in the military, it is uncertain what the opposition will do next. At that point, the ball could well be in Guaidó’s foreign backers’ court. The international politics of Venezuela’s crisis have also become ever more fraught over the past year. The exodus of millions of Venezuelans has strained neighbours’ budgets, added to social tensions in those countries and angered their leaders. As diplomatic efforts to find a solution floundered, influential regional voices insisted that no option, including military force, could be ruled out. These have included not only Almagro but, on occasions, U.S. President Donald Trump and the influential Florida Senator Marco Rubio. Brazil’s new far-right president Jair Bolsonaro’s hard-line statements during his election campaign and since assuming office, combined with calls from exiled opposition leaders for a “humanitarian intervention”, have ratcheted up rhetoric around the crisis. The Maduro government has responded in kind, with belligerent statements and accusations that neighbours are plotting the president’s assassination and an all-out invasion. Existing border squabbles, particularly with Colombia and Guyana (two-thirds of whose territory is claimed by Venezuela) have added fuel to the fire. Guyana’s 2017 discovery of substantial oil deposits in offshore waters claimed by Venezuela, and its decision to refer the case to the International Court of Justice in The Hague, have resulted in an escalation of a long-dormant crisis. For Colombia, the growing presence in Venezuela of guerrillas from the ELN, the country’s only remaining significant insurgent group and the perpetrators of a car bombing in Bogotá that killed 21 people at a police training centre on 17 January, is a major concern. Peace talks with the ELN have collapsed, and both the guerrillas and remnants of the Revolutionary Armed Forces of Colombia—People’s Army (FARC) – formerly Colombia´s largest guerrilla group, which demobilised as a result of a peace deal under Colombia’s previous government of Juan Manuel Santos – have been drawn to the gold mining zones of southern Venezuela, allegedly with the approval of senior Venezuelan officials. Nor are western hemisphere actors the only ones involved. In December, Russia’s deployment of a small fleet of military aircraft, including two Tu-160 strategic bombers on what Moscow called a “training exercise” to Venezuela, added to geopolitical tensions. Defence Minister Vladimir Padrino López said Russia and Venezuela were both prepared to defend Venezuelan territory. Maduro has announced that diplomatic ties with the U.S. will be cut. The inability of the region’s traditional conflict-resolution actors to find an exit to Venezuela’s crisis partly explains why it has boiled over. The OAS has failed to muster the necessary votes among its members for a more productive role, due largely to the lingering loyalty to Venezuela of Caribbean states that have received its energy assistance in recent years. Mercosur, the South American trading bloc to which Venezuela was admitted in 2012 primarily for political reasons, because it was then seen as an ally of leftist governments in Brazil and Argentina in particular, suspended Caracas’s membership indefinitely in 2017; it has contributed little to resolving the crisis. In 2017 a dozen Latin American and Caribbean nations created the ad hoc Lima Group specifically dedicated to that end, but its credibility is now at stake after most of its members opted to recognise Guaidó. Colombia, Brazil, Canada and other countries in the Lima Group – though not Mexico – joined the U.S. in backing Guaido’s interim presidency. Should no major rupture in Maduro’s military support base transpire, this move risks severing all ties between Caracas and most countries in the Americas, and generating reprisals against the opposition. If there is a military rupture, these countries will have to handle a potentially chaotic collapse of the government that could, in the best-case scenario, enable a transitional administration to take power and create the conditions for elections in the short term. There are other risks. Maduro has announced that diplomatic ties with the U.S. will be cut. However, the U.S. does not recognise his authority to expel the embassy officials. Should this stand-off lead to intimidation of embassy staff, or should Maduro move to arrest Guaidó or crack down on the opposition, Washington has already decided to introduce tougher sanctions, including targeting Venezuelan oil refineries in the US, while calls for a foreign military intervention are likely to become more insistent. For its part, the EU has applauded the National Assembly’s efforts to restore democracy in Venezuela and member states have started to recognise Guaidó as president. Meanwhile, Russia, China Turkey, Iran, Cuba, Bolivia and Nicaragua have all expressed their support for Maduro’s presidency. In light of deepening internal tensions and the breakdown of diplomatic ties, the EU and member states should redouble efforts to create conditions – in what is now a far more challenging context – for the resumption of credible talks between the sitting government and opposition. Immediate moves to defuse the tension between the two presidents, or whichever new power blocs emerge in coming weeks, should include the restoration of the National Assembly’s powers, release of all political prisoners, and dissolution or curbing the powers of the National Constituent Assembly. Should a temporary settlement be reached between the two (or more) sides along these lines, the EU should then proceed to pursue a roadmap for wide-ranging negotiations on political and economic reform, facilitated by international guarantors. Optimally, such talks would give rise to an interim cross-party government composed of elements of chavismo and current opposition leaders, before free presidential and parliamentary elections observed by international monitors are conducted. The EU should also maintain its current support to the National Assembly as an indispensable part of any transition. The EU should gather as broad a coalition of foreign states as possible on the basis of their shared concern over the regional destabilisation caused by Venezuela’s turmoil and their wish to see a peaceful and sustainable outcome to the crisis. All states involved should be willing to apply diplomatic and other forms of pressure to push for substantive negotiations and support a future transition, including with funding for economic reconstruction. The EU’s proposed Contact Group is likely the best option for achieving this, though its success will depend on the inclusion not only of the U.S. and the Lima Group, but also of countries the Maduro government regards as allies, such as Russia, China, Turkey or Bolivia. If that proves impossible, the EU should at least invite neutral countries, such as Mexico or Uruguay, to join, in the hope that their participation could spur that of Venezuela’s allies. Mexico has indicated its interest in joining. The EU and its member states should also discourage others from adopting policies that risk deepening the crisis or blocking possible exit ramps. These include an oil embargo, which would likely worsen the country’s economic miseries or, worse still, any kind of military intervention. At the same time, the EU should keep up stiff pressure on the government. Already it and some European governments have imposed sanctions on senior Venezuelan officials; they could make clear the possibility of further sanctions on government officials involved in crackdowns against protesters or the harassment of the National Assembly or its members. They simultaneously should set clear conditions for gradually lifting such sanctions based on the government moving toward genuine negotiations. The EU should also maintain its current support to the National Assembly as an indispensable part of any transition. It might, for example, offer to approve fresh credits for economic reconstruction or greenlight the lifting of sanctions against government figures if so requested by National Assembly leaders. Finally, the EU ought to increase development aid and support to countries responding to the refugee crisis, both for humanitarian reasons and to shore up the region’s stability by reducing the economic and social impact of large-scale immigration.